UnitedMind is committed to bringing laughter to the general public in the United Kingdom. 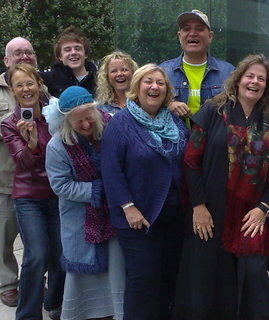 Since starting as a Laughter Yoga Training Provider in 2004 many hundreds of people have been inspired to start public and community laughter groups. The Laughter Clubs are spread around the country and more groups start every month, each with a vision to spread laughter for the personal, physical and psychological benefits obtained through the activities. The public sector employ many Laughter Professionals without taking full advantage of the added value they bring to the organisation. Motivation, self-esteem, communication, productivity, inclusion – all beneficial core values to any organisation as well as individual. There is no doubt health is everyone’s business and we need to meet the needs of the communities in a progressive and transformative way! Together with The Regency Training Foundation UnitedMind deliver programmes to promote inclusion and confidence in the community. Read more about our work with The Regency Training Foundation on our Alliances page. For further details and information about our bid to meet the countries requirements for their Healthier People, Healthier Communities campaigns please contact us. Big Society – still a goal! The laughter clubs can be developed and maintained as a major contributor to several of the aims of the Big Society plans as well as the counties’ plans for happier, healthier communities. By training specific target groups and teaching them how to set up community groups and businesses they become an active part and co-creator of their own world. The participants will be enabled to bring together groups of people and facilitate activities that encourage community as well as personal growth. The aim of the Laughter Yoga Leader Training is to encourage and enable individuals to start Laughter Clubs in their communities and by doing so they support and inspire others who may be equally challenged to embrace the changes and challenges suggested and promoted by the wider-scale ideas. Starting a Laughter Club or Community Group is the first step towards a sense of achievement and improving self-confidence which in turn inspires people to become more active either in the community or in the workplace. Through this encouragement via the training idividuals can have an impact on their own life from a confident perspective after having learned techniques to help them in dealing with adversity and challenges as well as on the groups in which they interact. Furthermore, by bringing the laughter and learning into their community they help inspire a wider audience to be part of the community plans and effectively the execution of these. UnitedMind is the patron of The Laughter Club International (UK) which runs in the South-East England in St. Albans, Bushey, and in the North-East England in Peterlee. The Laughter Club International (UK) is a non-profit community group where all proceeds go to support charity organisations, locally as well as nationwide.